Lowestoft singer-songwriter Ria Ritchie has been highlighted as a future talent by two influential artists. The 22-year-old is currently co-writing with UK chart-topper Plan B and is having talks with Jay-Z's music company about expanding her career. Ria caught their attention with her DIY acoustic recordings on YouTube. "I did a cover of Ne-Yo's song Because Of You and uploaded it to YouTube," said Ria. "People kept saying they liked it and I just added more." Ria's YouTube channel, which was set up to see if her guitar playing was "any good", now has over six million views. 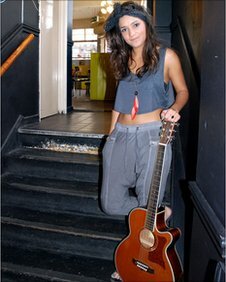 Ben Drew, or Plan B, became aware of her talent in December 2009 and the pair have co-written four songs to add to Ria's repertoire, which she hopes might go towards a debut album. 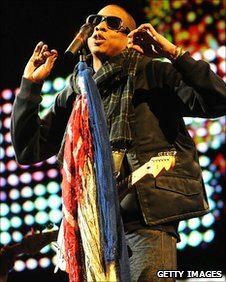 "I'm writing songs with Plan B at the moment - it's great. It gives me ideas I wouldn't have thought about if I was writing on my own," she said. "Every time I write with Plan B we'll do some studio work and then go back to his and jam in his lounge - it's a really relaxed environment to write in. "I went to his recent show in Camden for the iTunes Festival and we hung out afterwards with his band. He's really cool and down to earth." Ria has also created a studio partnership with Ruth-Anne Cunningham, who co-wrote Pixie Lott's debut album Turn It Up. "I definitely prefer co-writing with people, especially whilst I'm learning. Ruth and I get on so well and we wrote a really nice song together," she said. Ria has also been in talks with Jay Brown - business partner to rapper and entrepreneur Jay-Z. His entertainment company, Roc Nation, recently signed a contract with Takeover Entertainment - a management company founded by Jack Foster and Archie Lamb from Norwich, who have managed Tinchy Stryder's career since 2006. The collaboration will form a new music company called Take Over Roc Nation, which will look to seek out some of the freshest talent in music. Ria could be one of those new talents to join the illustrious rank of artists including Rihanna and Ne-Yo, who were also scouted by Jay Brown. "[Jay Brown] said he was digging my tracks and he played me some songwriters he thinks he can put me with," said Ria. "It was quite scary but he was really chilled out. "I've never been in that sort of environment before or met anyone of that status. "He was talking about when he found and signed Rihanna and about Beyonce's Single Ladies record."